Vinyl album: TOOTS3 (Strawberry Hill Productions, UK, 1987). Single sleeve, cartoon illustration. No lyric sheet or inner. This is thought to be a private pressing, organised by the Strawbs themselves on vinyl only. The later vinyl release by Chord (see below) will have coincided with the Chord CD release. Neither this nor the Chord release have catalogue numbers on the identical labels. The copy scanned has a sticker at the bottom right of the back cover, from the record shop where I bought it. Back in the 80s I used to travel around university towns in the UK, visiting potential authors in the law schools. I usually used to make time to visit a local record shop, naturally. 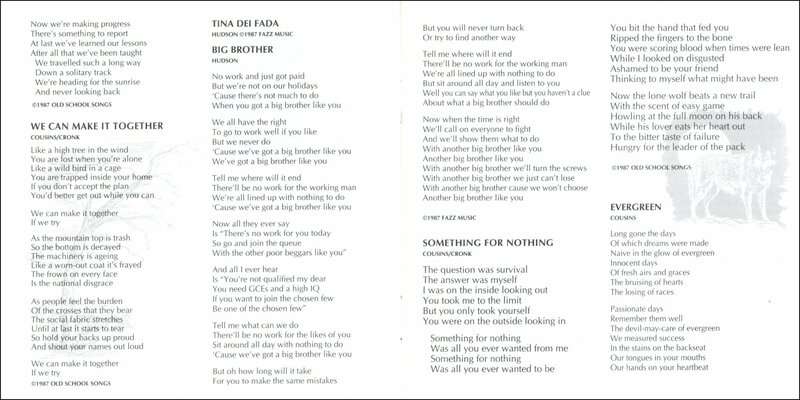 I was browsing in Catapilla in Exeter, Devon, when I heard "Something Or Nothing", thinking first it might be Peter Gabriel, but realising quickly it was the dulcet tones of one D. Cousins. I had no idea what it was, or that the Strawbs had very recently released a new album, the first for nearly nine years. It turned out this was a very early copy that the record shop owner (who was a former member of Vertigo prog band Catapilla, hence the name of the shop) had had it from Dave Cousins, who lived not far away. But there was no way in heaven that I was going to leave the shop without it, so he very kindly sold it to me, and I went home a happy Strawbs fan. I have acquired two autographed copies of this album, one with just Dave's signature, dated pretty much when this was released. The other has the full band's signatures, dated by DC in 1989. 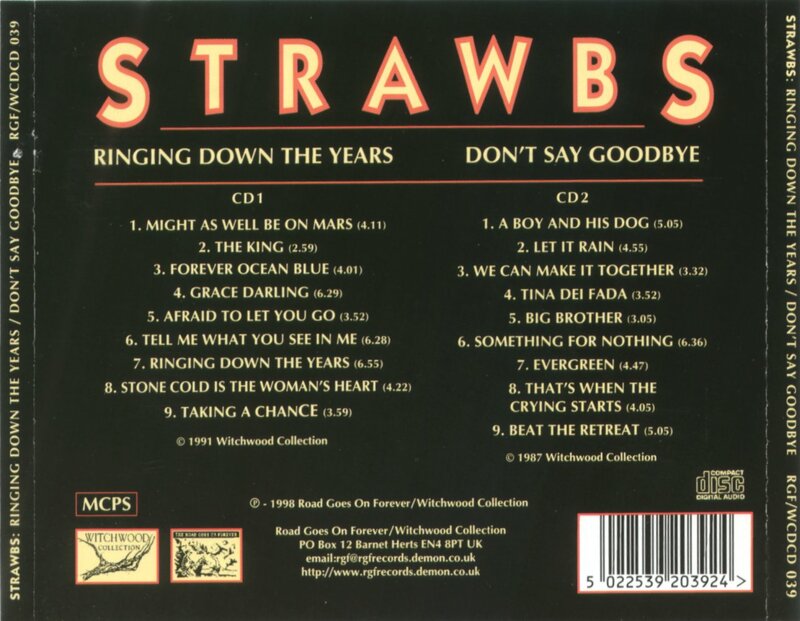 Vinyl album: Strawbs 1 (EMI Chord label release, UK, 1987 ?) Single sleeve, cartoon illustration. No lyric sheet or inner. Neither this nor the Toots release have catalogue numbers on the identical labels. 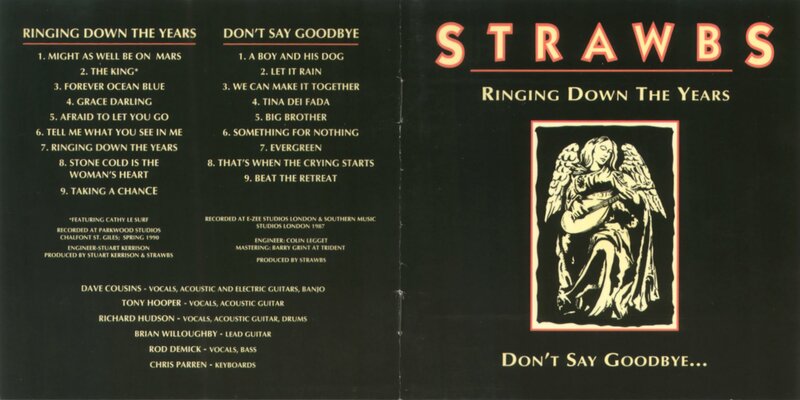 Whilst the Toots release above may have been a private pressing by Strawbs which preceded it, this would have been released alongside the Chord CD release below. 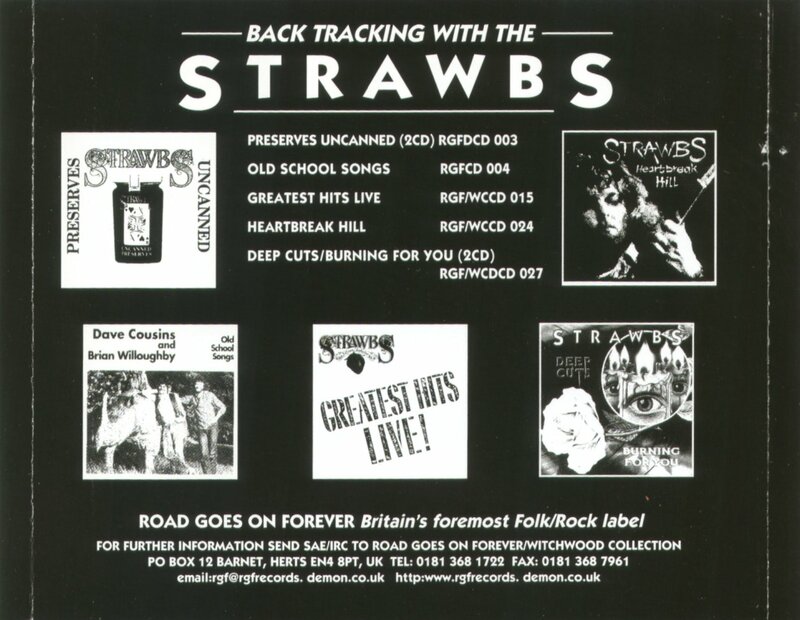 The spine has the STRAWBS1 catalogue number and the back cover has printed material at top left and bottom left, which does not appear on the Toots release. Vinyl album: VL 3018 (Virgin Canada, 1987) Single sleeve, no lyric sheet or anything. Front cover is exactly same as UK, back cover very similar but with Virgin logos and details etc. Vinyl album: Alfa ALI 38130 (Japan, 1988) Single sleeve, with 4pp booklet. Page 1 has Japanese sleeve notes and track listing. 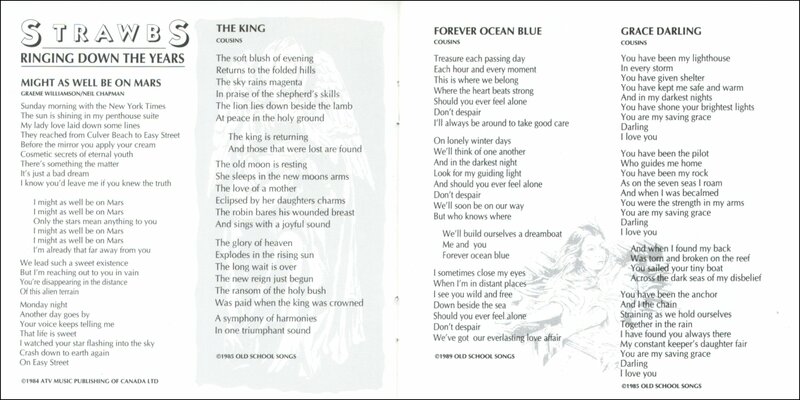 Pages 2 & 3 have English and Japanese lyrics, a few typos but not bad. The last page has a minimalist reproduction of the cover image. Cassette: no release number (UK, 1987) Probably manufactured by the band for sale at gigs. Cartoon on front cover, track listing and credits inside. No printed bar code but cassette case has a bar code sticker. Same running order as album. Inner is autographed by Dave Cousins on 23 June 1988. Most likely sold at a gig on that date. 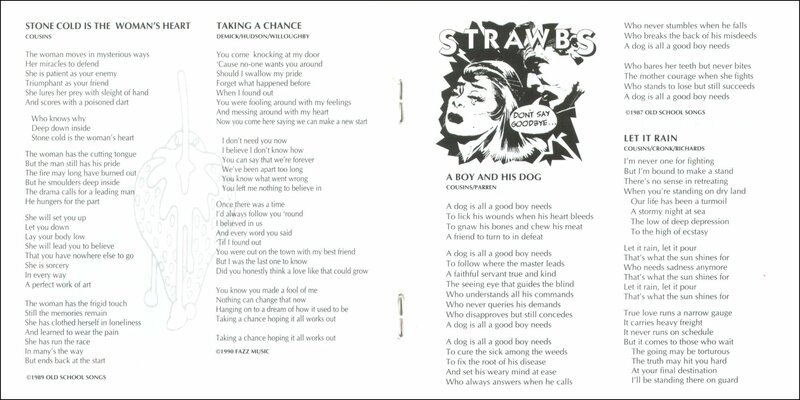 Cassette: STRAWBC 1 (Chord, UK, 1987) Cartoon on front cover, track listing and credits inside. Back flap of cover has printed bar code and "Distributed by" and Supertrack logo. Same running order as album. Cassette: Virgin VL4-3018 (Canada, 1987) . Wraparound cover. Chrome cassette. Same running order as album. CD: CD009 (CHORD, 1987). 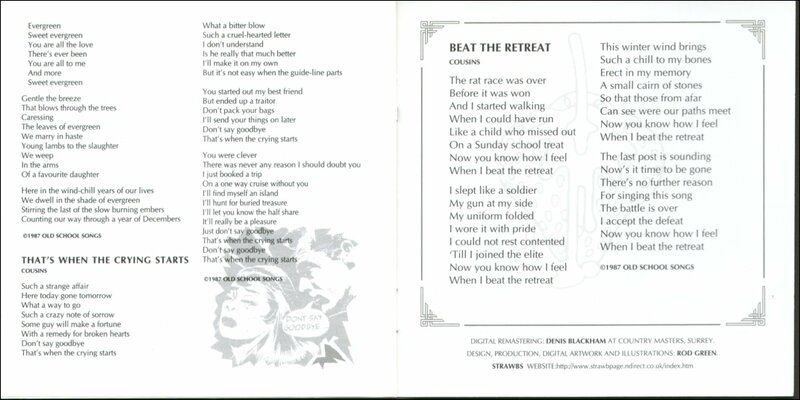 Booklet reproduces front and back covers of album sleeve, with 6 pages of photos of band not included in vinyl package. No lyrics. CD: Alfa 32XB-253 (Japan). 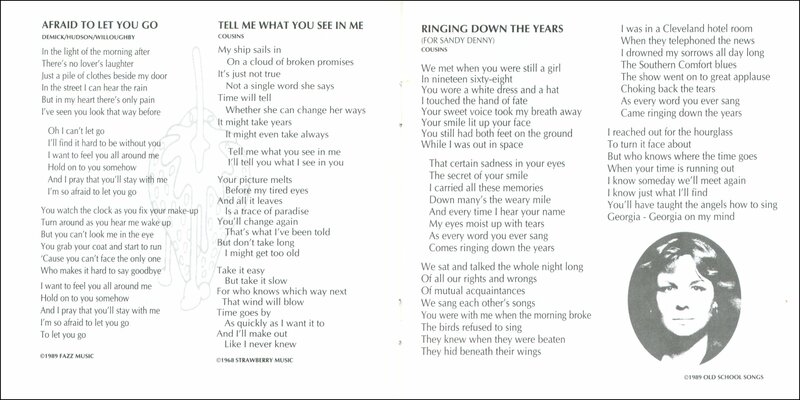 Lyrics insert in English and Japanese, which is a reduced size version of the Japanese LP version above. 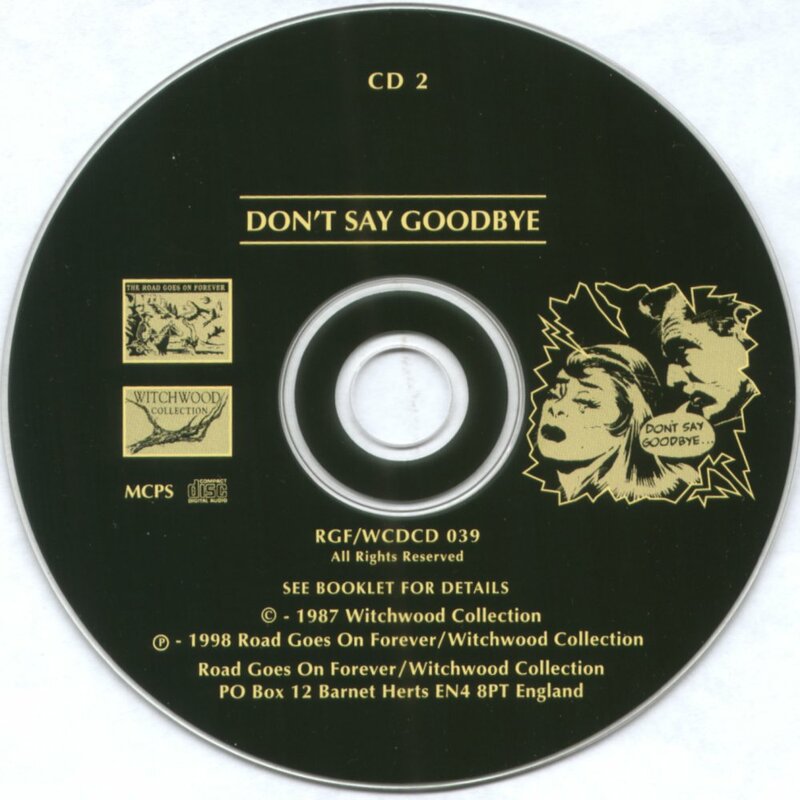 CD: RGF/WC DCD039 (ROAD GOES ON FOREVER, 1998, 2 CD set with Ringing Down The Years).Newly designed cover; booklet includes lyrics to both albums, but no photos. DAT: STRAWBS DAT1 (EMI Chord). Limited edition of 100 copies for export to South Africa.